New Procedure – Minimum 2 people for all backcountry ski shuttles. Update For Saturday Feb 23 – the bottom portion of all trails might have a crust from the warm-up on Thursday. Upper trails, mostly powder snow surfaces. 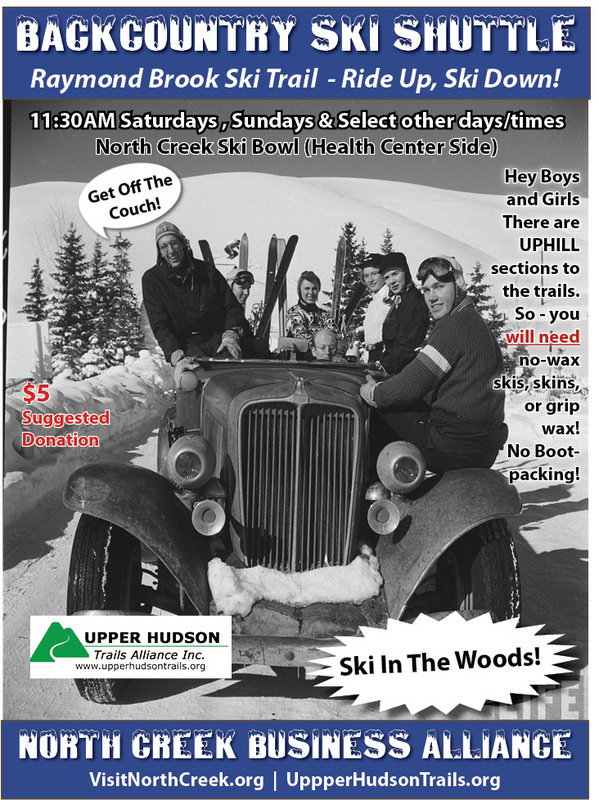 The North Creek Business Alliance in association with their North Creek Shuttles, provides an access shuttle to the backcountry ski trails on Barton Mines Road. Ride up and Ski Back! These are cross country ski trails with some uphill sections so backcountry skis are usually required with a no-wax pattern, grip wax or skins – NO BOOT PACKING. Snowshoers also welcome. Skiers are shuttled up to the Barton Mines Road Trailhead (about 5 miles by road). The ski down back to Rt. 28 Trailhead or The Ski bowl is 3.5 miles with alternative routes up Rabbit Pond Trail. $5 Suggested Donation.